Fox Hollow Farms strives to provide a truly memorable equestrian experience that will last a lifetime. 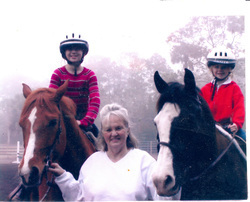 From beginner to expert horsemen, Fox Hollow Farms caters to all levels of horse lovers! We have over 70 years of knowledge and ‘World Champion’, experience. Our services include everything from riding lessons and horsemanship, horse leasing, to, pony parties and private trail rides. Fox Hollow Farms is conveniently located in Ponte Vedra Beach, Florida. Please call us today to book lessons or schedule a tour of our facilities. Fox Hollow Farms can trace its origins back several decades to Greenfield Stables of Jacksonville, Fl., and the rich equestrian traditions of horse training, riding, horse shows and weekend rodeos. A popular gathering place not only for horse enthusiast, but founder Nell Hastey also held Sunday afternoon concerts featuring young local area musicians, some of whom would eventually go on to national recognition, such as Lynyrd Skynyrd , Molly Hatchet, as well as Greg and Duane Allman in thier earlier band called Second Coming.